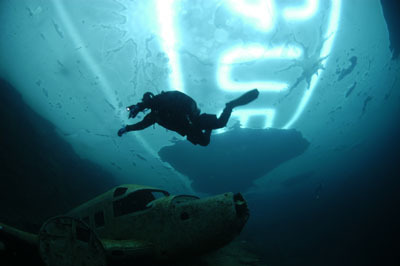 There is one thing about Canada that scares a lot of divers away... the cold winters. There are colder places to be than Eastern Ontario, but we do have our fair share of "wonderful" winter weather. 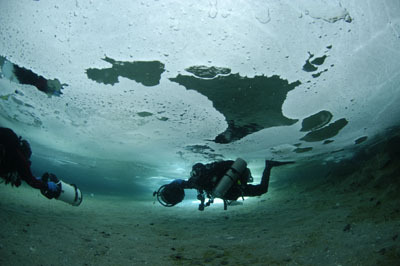 This opens up a whole other type of diving for us: Canadian Ice Diving. Many will jest that ice is for their drinks, but there are a group of us that like to get under it. We have a regular group of dive buddies that we dive with during the winter, so teams are never an issue. We do our predive gear checks before gearing up, as when you enter the water, you don't want to be too long on the surface, to avoid unnecessary gear freezing. Steve Blanchard is our primary hole cutter, and has become somewhat of an expert at it (written with a wry smile). We have evolved the hole from a triangle, into a large pentagon, with a runway, for an easy exit up the beach of the quarry. 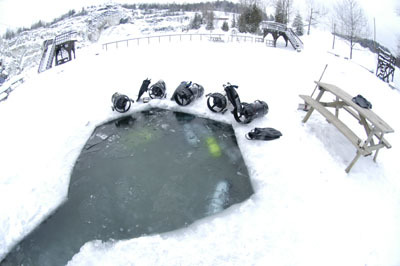 Morrison’s Quarry, in Wakefield, QC, is where we do our winter ice diving and skills dives. It is a fantastic place, with different shelves at different depths, down to approximately 120’. 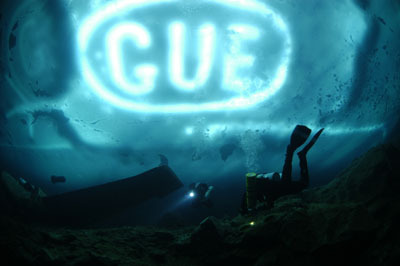 We particularly like this place, as the water temperatures do not normally go below 37 degrees Fahrenheit, and does not seem to push the limits of the gear. There is no current, it is a controlled environment, and is not easily silted. 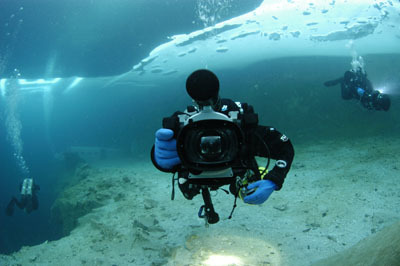 On a regular ice diving day, we have the primary tie off already set, before entering, and then a secondary tie off below the surface, running a reel to the plane. Just before descending, we will breathe off of our regs, to ensure everything is working properly. We do a modified S drill once we get below the surface, bubble and valve checks, and away we go. When doing skills dives, we’ll head to the plane at approximately 25’, and work on whatever it is we are concentrating on that day. We seem to do a lot of valve drills, and often have cameras and scooters in the water as well. We will also head down to the sub, at 60’, to work on ascents. The art of DSLR photography is a new adventure for me. I am using a Nikon D100 with an Aquatica housing, and having a lot of fun getting used to it. It is quite a change from the little point and shoots I was using. All I really wanted was something to update my "Bloggy Thing" with. We also have Leigh (aka Wooferbitch), that has worked his editing genius in the studio, with footage from our VX2000 and Halcyon housing. Steve does most of the video shooting, Leigh does some, and I’ve done a very small amount. This has been an absolute blast, diving with Steve and Leigh, and being a part of the We Go Down crew. We often have friends that travel quite a distance to dive with us here, as the visibility is second to none in the winter months. We are very fortunate to have such a large group of like-minded and team oriented divers to dive with, and do what we all have such a passion for. So despite the frozen gear, zippers, and drysuits that can stand up on their own, it's a part of what we love to do, and wouldn't trade it for the world.